Using Prussian Blue, I have begun to add some texture to the areas surrounding the palm leaves. I just allowed my round brush to dance over the background. I will glaze later to soften the look of this area. 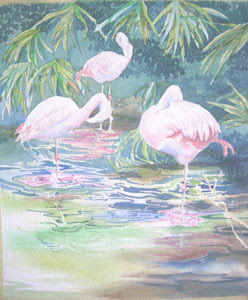 I am using various reds from my palette to add pink glazes to the flamingos and to their reflections in the water. I also used Prussian Blue, French Ultramarine Blue, and various greens to add some crisp details to the reflection areas in the water. The colors used in your background will determine which colors are reflected into the water. Sometimes it is helpful to actually draw in the reflection shapes with a pencil and slightly shade the darker values to guide you. These little shapes can become a huge, confusing maze if you don’t study your references carefully. 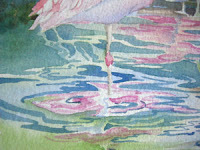 This is a detail of the reflections in the water at the base of one of the flamingos. Play with the abstract shapes, just remember, they should make some kind of sense based on what they are reflecting!